Waltham butternut squash was an All-American Selections Winner in 1970 and continues to be a favorite today. 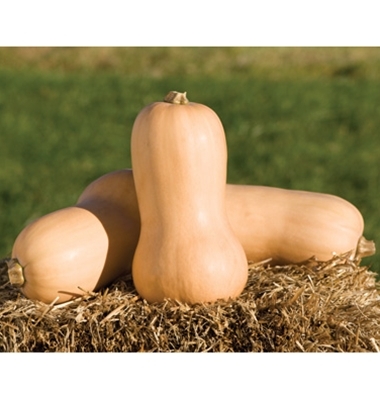 The light tan skin encases a yellow-orange flesh that has a nutty, yet sweet flavor. They have a straight neck with a bulb at the end can reach 8-10 inches in length which can weigh around 6 pounds. After harvesting, in order to keep butternut squash for a long period, you must cure the squash. Do this by storing it in a warm, dry location for a few days and then moving it to a cooler location (about 50-55 degrees) and it should last into the winter. Waltham Butternut Squash is great for baking. It cooks up sweet and tender and holds it’s color after cooking. Spacing: Plant 36″ apart in 40″ rows. Height: Grows 16″ to 24″ tall. Outstanding Features: Squash is very easy to grow and can be harvested all summer as long as you keep it picked to promote further production. Harvest when fruit is about 7-9 inches long for best flavor. Tips: Plant Squash when all threat of frost is gone. Pick mature Squash on a daily basis to keep the plant producing longer. Leaving ripe Squash on the vine will cause it to become tough and inedible.